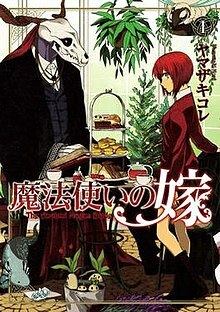 The Ancient Magus' Bride (魔法使いの嫁, Mahō Tsukai no Yome) is a Japanese dark fantasy shōnen manga series written and illustrated by Kore Yamazaki. The series is published in Japan by Mag Garden in its Monthly Comic Garden magazine. The manga is licensed in North America by Seven Seas Entertainment. Wit Studio produced a three-part prequel OVA of the manga and produced an anime television series adaptation that aired from October 2017 to March 2018. Having been ostracized by both her relatives and partially by society, orphaned high school student Chise Hatori decides to sell herself at an auction in order for somebody else to take her in and have a new place to call home. At the auction in London, she is sold for five million pounds to Elias Ainsworth, a seven-foot-tall humanoid with an animal skull for a head. This magus, who seems closer to demon than human, will either bring her the light she desperately seeks or drown her in ever deeper shadows in her new country, Britain. The teenage protagonist and titular character of the story. She is the apprentice and future bride of Elias Ainsworth. Her father abandoned the family when she was young, taking her baby brother with him. Her mother committed suicide in front of her leaving her to rightfully feel unwanted by her relatives. She allows herself to be sold into slavery so someone will take her in. There she is sold for 5 million Pounds to Elias. He tells her she is a Sleigh Beggy, a special magus who can draw magic from her surroundings and within herself causing a strain on the body. Because of this Sleigh Beggy are very weak and die young hence why Elias took her in, hoping to prevent her death. She has about three years left to live naturally at most. Her small and fragile state gives her the nick names Robin and Little Bird Mage. She is constantly being given gifts that suppress her magic to try and keep her healthy. After being taken in by Elias she starts practicing magic and finds she has a talent to sleep magic, but can basically do anything at the cost of tremendous strain on her body. The Child of Thorns, Chise's master and fiancé, once apprenticed to Master Lindenbaum. A being with both fae and human elements, his origins are a mystery. It is hinted that he was born from the shadows of the forest, but definitely traces of human. Possibly a mage who dabbled in black magic and lost his humanity and memories. He is known as the Thorn Mage. The other faeries see him as an abomination, something he does not mind. Occasionally he uses glamour spells to hide his animal appearance taking on a similar look to people he knows or sees. In the series he is shown to first resemble Simon, then Chise and then a woman no one knows. He can sprout and control thorns and also turn himself into shadows. When angry enough, he takes on a more monstrous beastly form made up of various animal parts, such as a fish tail or wings or snake body. His innate lack of understanding human emotions makes Lindenbaum call him a child. He purchases Chise not only because she is a rare Sleigh Beggy, but he hopes she can teach him about human feelings and behavior. He dislikes children because they often see through his shadow magic and fear him. The ones that don't fear him ask a lot of question about him he can't answer. He is called "Pilum Muralis" by the wizards. Introduced in chapter nine, he is Chise's familiar, a Church grim who was originally a graveyard guard dog who chased away grave robbers and evil spirits. He was formerly called Ulysse (ユリシィ, Yurishī) and used to be owned by Isabel in chapter ten. He thinks of himself as a human, thus able to maintain human form, until he remembers who he is in chapter twelve. He shares a mental link with Chise and considers her a sister. When in his dog form Ruth resembles an Irish Wolfdog, although this form can change much like Elias, sometimes moving in Chise's shadow. Introduced in chapter two, she is the fairy landlady of the house where Elias and Chise reside. Originally a banshee (chapter twenty four), she is now a silent silkie and takes care of the housekeeping duties in the household. She is protective of Chise and has a strong dislike of Simon Kalm, the village priest, glaring at him when he enters Elias house and wrapping her arms around Chise to protect her. Introduced in chapter three, he is Elias's magician Master, commonly referred as Lindel, lives in the Land of Dragons, the last sanctuary of dragons. He is the caretaker of the dragon's nest. His title is Echoes, Song of Flowers and has lived for hundreds of years. Introduced in chapter fourteen, she is a beautiful vampire-like faerie who loves men and gives them talent at the cost of dying young. She had strong feelings for an old man named Joel Garland, but denied that they were in love as love would meant his inevitable death. Unfortunately, her presence was already killing him unintentionally at a slow rate. After learning this, Chise created a remedy that allowed them to see each other one last time (chapter twenty two). After Joel's passing, she tells Chise she will be living in Joel's garden and will not look for more lovers anymore. She later received the name, Redcurrant (レッドカラント Reddokaranto), as Joel and Chise noted her eyes were the same color as the flower in Joel's Garden. Introduced in chapter six, he is an alchemist who apparently hates Magi and magicians, but at the same time is caring towards his apprentice Alice. He was scarred in the face protecting Alice (chapter twenty seven) and later allowed Cartaphilius to take his left arm as material for an experiment so Alice wouldn't be used instead. He later rebels against Cartaphilius and also becomes interested in finding a way to prevent Chise's premature death. Introduced in chapter six. Officially he is known as "Cartaphilius", but prefers to be called Joseph (ヨセフ, Yosefu) after the grave digger boy he fuses together with. He is known also as the Wandering Jew, or the "Magician of the Flow". He is a mysterious being that looks like a young boy, but has been around longer than even Elias. So old that he even refers to Ainsworth as a "little boy". A long time ago, people said that "God's Son" cast an immortal curse on him for mocking him during the crucifixion, (much like Gestas); it's said his immortality will last until Judgement Day. Through this curse he is unable to die yet his body continues to rot causing continuous pain and suffering. He has the appearance of a human, but is created using the parts of other creatures – as seen in chapter eleven when he was struck with a magic bullet and again in chapter 43 where he collects pieces for his body. He travels around the world performing gruesome experiments on both living and dead creatures as well as both human and fae in hopes of creating a body that will not decay or will give him the ability to finally die. He has persisted so long at this that he has forgotten why he does experiments causing him to bring nothing but suffering and carnage. His one true desire is to be forgiven and be able to live a life without suffering. Joseph was a kind young boy who is rumored to be the son of a witch. He is in charge of digging graves for his village. The village has rejected and bullied him, even going as far as throwing rocks at him. They call him strange and creepy because of his ability to see fae and speak with the dead. One day he hears a voice calling for help. He follows the voice and finds Cartaphilius, who looks like a shriveled up corpse. He brings Cartaphilius to his house and attempts to nurse him back to health. Cartaphilius makes Joseph feel needed causing Joseph to grow attached and he asks Cartaphilius to take him away once he is healed. Upon learning that Cartaphilius will never get better in order to take him away to a better place, a strange fusion is made between the two giving Cartaphilius Joseph's body in order to take him away from his misery. After the fusion however, both enter a state of temporary amnesia. This fusion does not stop the curse from slowly consuming both of them, rotting them from the inside out. Joseph then regains some memory after hearing about Cartaphilius' past. He then gets angry for suffering for something he didn't do and Cartaphilius doesn't even remember doing. Introduced in chapter eight, she is the Faerie Queen and Oberon's wife. She looks like a beautiful and buxom woman riding a donkey, but can temporarily possess other faeries. She is a proud and very kind motherly figure to Ainsworth and frequently requests he comes to live with her in the faerie kingdom. She still considers Ainsworth her child as he is the shadow of nature even though he is mostly beast. Despite repeated requests from Ainsworth not to, she feels sorry for him and wishes for his happiness because she knows he is not accepted by human or fae and may very well never find a place in the world. Introduced by Lindel as his master and teacher. She is older than Lindel and is the person that gave both Lindel and Elias their names. First seen in episode 16 of the anime, and chapter 28 of the manga. She is a friend of Chise and the older sister of Ethan. While visiting her grandparents over Christmas she got into an argument with Ethan, in which afterwards, he ran off into the woods. Then Stella frantically went around town looking for him, but she couldn't find him and strangely everybody but her forgot he existed. Then she ran into Chise and Elias, telling them what happened and begging for their help. They agreed to help, then found out that it was Ashen Eye that took Stella's brother. Once they saved Ethan, Stella repays Chise and Elias by baking them lots of sweets when she visits her grandparents once a month. A librarian who takes care of Chise. He is seen in The Ancient Magus' Bride: Those Awaiting a Star OVA. Chise's father. Back in Japan, he kept their neighbors from prying on them until he and his youngest son Fumiki ran away together, leaving Chise and her mother to fend for themselves. Chise and Fumiki's late mother. Originally before her death, she was kind, loving and soft-spoken; she tried protecting her daughter from the creatures that were drawn to her--but after a while, she grew to hate her own daughter. The stress of having to care for Chise tore her apart and decided to end her own life by killing herself in front of Chise. It's implied that in the past, Chise's mother had gone through similar things when she was younger but was able to persevere. The stress of dealing with it again along raising Chise was what made her susceptible to her manipulation and near strangulation of her daughter. Chise's younger brother who mysteriously disappeared with his father. Like the rest of his family, Fumiki has incredible magical energy that in the same vein as his father created a protective barrier around the Hatori family apartment to keep the neighbors away. A distant relative of Chise through marriage, her husband Shouji forced her to take her in to avoid having a negative reputation and raised her along her two sons. However, Akiko was heavily negligent of Chise and was constantly complaining to her husband due to his business trips, leaving him to not deal with the young mage to be. Kore Yamazaki began publishing the series in Mag Garden's Monthly Comic Blade magazine in November 2013. The magazine ceased publication on September 1, 2014, at which point the series was moved to the new Monthly Comic Garden magazine, while also continuing to be released on the Monthly Comic Blade website. Seven Seas Entertainment licensed the series for publication in North America in October 2014. A drama CD was bundled with the limited edition of the fifth volume, released in March 2016. The series has been collected into nine tankōbon volumes, which have been republished in English. "The scale distinguishes not between gold and lead." "Everything must have a beginning." "Speak of the devil, and he is sure to appear." "None so deaf as those who will not hear." "Little pitchers have long ears." "Lovers ever run before the clock." "Better to ask the way than go astray." "It is a long lane that has no turning." "A Contented mind is a perpetual feast." "The longest day has an end." "God's mill grinds slow but sure." "God's mill grinds slow but sure.II"
"Zeal without knowledge is a runaway horse." "Examples are better than precept." "Any port in a storm.I"
"Any port in a storm.II"
"Any port in a storm.III"
"You can't make an omelet without breaking a few eggs.II"
"The darkest hour is that before the dawn." "What is bred in the bone will not out of the flesh." "It is the first step that is troublesome." "Birds of a feather flock together.I"
"Birds of a feather flock together.II"
"Birds of a feather flock together.III"
"Birds of a feather flock together.IV"
"The cowl does not make the monk.I"
"The cowl does not make the monk. II"
"The cowl does not make the monk. III"
"First impressions are the most lasting. I"
"First impressions are the most lasting. II"
A three-part prequel anime was announced in the fifth volume of the manga. The series is titled The Ancient Magus' Bride: Those Awaiting a Star (魔法使いの嫁 星待つひと, Mahō Tsukai no Yome: Hoshi Matsu Hito). It is directed by Norihiro Naganuma and written by Kore Yamazaki, with scripts by Aya Takaha. Wit Studio produced the animation and Production I.G is credited with planning and production. Hirotaka Katō designed the characters and Bamboo is in charge of the background art. The series' music is composed by Junichi Matsumoto and produced by Flying Dog. The episodes were bundled with the sixth, seventh and eighth volumes of the manga, between September 10, 2016, March 10, 2017 and September 9, 2017. The first episode was shown in theaters for two weeks, starting on August 13, 2016; the second episode premiered in theaters on February 4, 2017; and the third episode premiered on August 19, 2017. Crunchyroll began streaming the first episode on September 10, 2016. An anime television series adaptation was announced on March 10, 2017, and aired from October 7, 2017 to March 24, 2018, on MBS, Tokyo MX, BS11 and other Japanese channels. JUNNA performed the opening theme "Here", and Hana Itoki performed the ending theme "Wa –cycle-" (環-cycle-). The second opening theme is "You" by May'n, and the ending theme is "Tsuki no Mō Hanbun" (月のもう半分, The Moon is Already a Half Moon) by AIKI & AKINO from bless4. Funimation streamed an English dub. The anime won the best drama award at 2017 Crunchyroll anime awards. Manga Entertainment will distribute the series on home video in the United Kingdom and Ireland. Volume 2 reached the 9th place on the weekly Oricon manga chart and, as of September 21, 2014, had sold 104,518 copies. The series had sold half a million copies as of June 2015, 2.5 million copies as of March 2016, and over three million as of September 2016. By December 2017, the series had five million copies in print. The series was number two on the 2015 Kono Manga ga Sugoi! Top 20 Manga for Male Readers survey. It was number 36 on the 15th annual "Book of the Year" list by the Da Vinci magazine in 2014. Da Vinci readers also ranked it at number two in a poll to determine the series most likely to "make their big break" in 2015. The series ranked number one on a poll of 2,360 bookstore employees to determine 2015's top 15 manga series of under five volumes. It was one of fourteen titles nominated for the eighth Manga Taishō awards in 2015. Volume two appeared on The New York Times manga bestsellers list for four weeks, rising to third place for two. Volume three debuted on the list at second place, volume four debuted at first place, and volume five debuted at fourth place. Reviewing the first volume for Anime News Network, Nick Creamer gave it a grade of A−. He praised the series art, noting that it "does great work in impressing upon the audience the same sense of wonder Chise experiences throughout. The character designs are expressive and backgrounds ornate". Commenting on the relationship between Chise and Elias, he wrote that "having this story go in a legitimately romantic direction would likely raise thorny issues of power dynamics and consent", but remarked that, as it was, the story "does a commendable job of making both Chise and Elias understandable and likable characters". He concluded his review by writing: "What conflict all these lovely details might be leading towards is a mystery so far, but the execution is so strong that I'm ready to follow wherever it leads." In his review of the second volume, he admitted to coming to an appreciation of the main characters' relationship, writing that "the ambiguities of their relationship actually seem like one more fitting piece of a world where every relationship is ambiguous". He called the series' magic "classic but still refreshing". He also commented that the series art "remains gorgeous and well-suited to the story all throughout this volume ... the backgrounds are lush and faces expressive, and the whole style has an ornate looseness to it that works perfectly for this kind of fantasy storytelling". He concluded by saying "If you have any appreciation for this style of classic fantasy storytelling, Ancient Magus' Bride is a can't-miss production". ^ "累計200万部を突破！ 『魔法使いの嫁』の危うくも温かい、独特な魅力を解き明かす！". ddnavi.com (in Japanese). Retrieved August 3, 2018. ^ a b Green, Scott (September 12, 2015). ""Ancient Magus' Bride" Manga to Get Drama CD". Crunchyroll. Archived from the original on September 26, 2015. Retrieved October 16, 2015. ^ a b c d "Seven Seas Adds The Ancient Magus' Bride Supernatural Manga". Anime News Network. October 2, 2015. Archived from the original on September 24, 2015. Retrieved October 16, 2015. ^ a b c d e f Green, Scott (27 December 2015). "VIDEO: "The Ancient Magus' Bride" Drama CD Previewed". Crunchyroll. Archived from the original on 31 December 2015. Retrieved 28 December 2015. ^ a b c d e f g "The Ancient Magus' Bride Manga Gets 3-Part Prequel Anime by Wit Studio". Anime News Network. March 9, 2016. Archived from the original on March 10, 2016. Retrieved March 9, 2016. ^ a b c d "The Ancient Magus' Bride Anime's 1st Part Previewed in Video". Anime News Network. June 24, 2016. Archived from the original on June 24, 2016. Retrieved June 24, 2016. ^ a b c d e f g h i j k l m n o p q "FunimationNow Fall 2017 SimulDubs & English Casts". Funimation. October 25, 2017. Archived from the original on October 25, 2017. Retrieved October 25, 2017. ^ a b c d "The Ancient Magus' Bride TV Anime Casts Daisuke Namikawa, Satoshi Hino, Mutsumi Tamura". Anime News Network. July 23, 2017. Archived from the original on July 25, 2017. Retrieved July 23, 2017. ^ "Ayumu Murase Joins "The Ancient Magus' Bride" TV Anime Cast In Time For Latest Preview". Crunchyroll. September 1, 2017. Archived from the original on September 2, 2017. Retrieved September 1, 2017. ^ "The Ancient Magus' Bride TV Anime's 3rd Promo Video Previews JUUNA's Theme Song". Anime News Network. September 1, 2017. Archived from the original on February 6, 2018. Retrieved September 1, 2017. ^ "Sayaka Ohara Joins The Ancient Magus' Bride TV Anime's Cast". Anime News Network. August 21, 2017. Archived from the original on December 7, 2017. Retrieved August 21, 2017. ^ "The Ancient Magus' Bride". Funimation. March 16, 2018. Retrieved March 16, 2018. ^ a b c Komatsu, Mikikazu (March 9, 2016). ""The Ancient Magus' Bride" OAD Project 1st PV Animated by WIT STUDIO (Attack on Titan)". Crunchyroll. Archived from the original on March 11, 2016. Retrieved March 10, 2016. ^ a b "Comic Blade Ceases Publication, Replaced with Comic Garden Magazine". Anime News Network. July 30, 2014. Archived from the original on September 24, 2015. Retrieved October 16, 2015. ^ Green, Scott (October 3, 2014). "Seven Seas Announces "The Ancient Magus' Bride" Manga License". Crunchyroll. Archived from the original on October 7, 2015. Retrieved October 16, 2015. ^ 魔法使いの嫁 [The Ancient Magus' Bride]. Mag Garden (in Japanese). Archived from the original on October 18, 2015. Retrieved October 16, 2015. ^ a b c d e f g h i "Ancient Magus' Bride, The". Seven Seas Entertainment. Archived from the original on October 21, 2015. Retrieved October 16, 2015. ^ 魔法使いの嫁 1 (BLADE COMICS) [The Ancient Magus' Bride 1 (Blade Comics)]. Amazon.co.jp (in Japanese). Retrieved October 16, 2015. ^ 魔法使いの嫁 2 (BLADE COMICS) [The Ancient Magus' Bride 2 (Blade Comics)]. Amazon.co.jp (in Japanese). Retrieved October 16, 2015. ^ 初回限定版 魔法使いの嫁(2) 【描き下ろし漫画小冊子付き】 (ブレイドコミックススペシャル) [The Ancient Magus' Bride (2) Limited edition with booklet]. Amazon.co.jp (in Japanese). Retrieved November 13, 2015. ^ 魔法使いの嫁 通常版 3 (BLADE COMICS) [The Ancient Magus' Bride 3 (Blade Comics)]. Amazon.co.jp (in Japanese). Retrieved October 16, 2015. ^ 初回限定版 魔法使いの嫁 3 (BLADE COMICS) [The Ancient Magus' Bride 3 limited edition (Blade Comics)]. Amazon.co.jp (in Japanese). Retrieved November 13, 2015. ^ 魔法使いの嫁 通常版 4 (BLADE COMICS) [The Ancient Magus' Bride 4 (Blade Comics)]. Amazon.co.jp (in Japanese). Retrieved October 16, 2015. ^ 初回限定版　魔法使いの嫁　4巻 (BLADE COMICS　SP) [The Ancient Magus' Bride 4 limited edition (Blade Comics SP)]. Amazon.co.jp (in Japanese). Retrieved November 13, 2015. ^ 魔法使いの嫁 5 (BLADE COMICS) [The Ancient Magus' Bride 5 (Blade Comics)]. Amazon.co.jp (in Japanese). Retrieved 22 February 2016. ^ 初回限定版 魔法使いの嫁 5巻 (BLADE COMICS SP) [The Ancient Magus' Bride 5 limited edition (Blade Comics SP)]. Amazon.co.jp (in Japanese). Retrieved November 13, 2015. ^ 魔法使いの嫁 6 (BLADE COMICS) [The Ancient Magus' Bride 6 (Blade Comics)]. Amazon.co.jp (in Japanese). Retrieved September 1, 2016. ^ 魔法使いの嫁 7 (BLADE COMICS) [The Ancient Magus' Bride 7 (Blade Comics)]. Amazon.co.jp (in Japanese). Retrieved February 9, 2017. ^ 魔法使いの嫁 8 (BLADE COMICS) [The Ancient Magus' Bride 8 (Blade Comics)]. Amazon.co.jp (in Japanese). Retrieved February 9, 2017. ^ "コミック　魔法使いの嫁　9巻". Mag Garden (in Japanese). Retrieved November 9, 2018. ^ "特装版コミック　魔法使いの嫁　9巻". Mag Garden (in Japanese). Retrieved November 9, 2018. ^ "Book: The Ancient Magus' Bride Vol. 9". Seven Seas Entertainment. Archived from the original on January 15, 2018. Retrieved January 15, 2018. ^ "コミック　魔法使いの嫁　10巻". Mag Garden (in Japanese). Retrieved November 9, 2018. ^ "初回限定版　魔法使いの嫁　10巻". Mag Garden (in Japanese). Retrieved November 9, 2018. ^ "The Ancient Magus' Bride Vol. 10". Seven Seas Entertainment. Retrieved November 9, 2018. ^ "コミック　魔法使いの嫁　11巻". Mag Garden (in Japanese). Retrieved April 1, 2019. ^ "The Ancient Magus' Bride Vol. 11". Seven Seas Entertainment. Retrieved April 1, 2019. ^ "小説　魔法使いの嫁　金糸篇". Mag Garden (in Japanese). Retrieved November 9, 2018. ^ "The Ancient Magus' Bride: The Golden Yarn (Light Novel)". Seven Seas Entertainment. Retrieved November 9, 2018. ^ "小説　魔法使いの嫁　銀糸篇". Mag Garden (in Japanese). Retrieved November 9, 2018. ^ "The Ancient Magus' Bride: The Silver Yarn (Light Novel)". Seven Seas Entertainment. Retrieved November 9, 2018. ^ a b Luster, Joseph (September 10, 2016). "Crunchyroll Streams "The Ancient Magus' Bride: Those Awaiting a Star Part 1"". Crunchyroll. Archived from the original on September 10, 2016. Retrieved September 10, 2016. ^ "The Ancient Magus' Bride Anime Previewed in 1st Promo Video, Visual". Anime News Network. March 9, 2016. Archived from the original on March 11, 2016. Retrieved March 9, 2016. ^ "The Ancient Magus' Bride Anime's Part II Slated for February 4". Anime News Network. August 15, 2016. Archived from the original on September 19, 2016. Retrieved September 9, 2016. ^ "Final Ancient Magus' Bride Anime Part Slated for August 19". Anime News Network. February 7, 2017. Archived from the original on February 8, 2017. Retrieved February 8, 2017. ^ "Crunchyroll Streams The Ancient Magus' Bride's Prequel Anime Part 1". Anime News Network. September 10, 2016. Archived from the original on September 11, 2016. Retrieved September 10, 2016. ^ "The Ancient Magus' Bride TV Anime's Cast, Staff, Streaming, Visual Revealed (Updated)". Anime News Network. March 10, 2017. Archived from the original on March 10, 2017. Retrieved March 10, 2017. ^ "JUNNA Sings The Ancient Magus' Bride Anime's Opening". Anime News Network. August 19, 2017. Retrieved August 19, 2017. ^ "Anime Spotlight - The Ancient Magus' Bride". Anime News Network. October 4, 2017. Archived from the original on January 19, 2018. Retrieved January 19, 2018. ^ "May'n, Aki&Akino from bless 4 Perform The Ancient Magus' Bride Anime's New Themes". Anime News Network. November 26, 2017. Archived from the original on November 26, 2017. Retrieved November 26, 2017. ^ "Funimation to Dub The Ancient Magus' Bride, Dies Irae, Kino's Journey, Juni Taisen, Urahara Anime". Anime News Network. September 21, 2017. Archived from the original on September 22, 2017. Retrieved September 21, 2017. ^ Stevens, Josh A. (November 5, 2018). "Manga UK To Release The Ancient Magus' Bride, Mob Psycho 100 & More". Anime UK News. Retrieved November 5, 2018. ^ "Japanese Comic Ranking, September 8–14". Anime News Network. September 17, 2014. Archived from the original on October 9, 2015. Retrieved October 16, 2015. ^ "Japanese Comic Ranking, September 15–21". Anime News Network. September 24, 2014. Archived from the original on October 7, 2015. Retrieved October 16, 2015. ^ Green, Scott (June 5, 2015). "VIDEO: Promo Spotlights "Ancient Magus' Bride" Manga". Crunchyroll. Archived from the original on June 8, 2015. Retrieved October 16, 2015. ^ "The Ancient Magus' Bride Anime's 2nd Part Previewed in Video". Anime News Network. September 9, 2016. Archived from the original on September 10, 2016. Retrieved September 9, 2016. ^ "The Ancient Magus' Bride Manga Has 5 Million Copies in Print". Anime News Network. December 4, 2017. Archived from the original on December 5, 2017. Retrieved December 9, 2017. ^ "Kono Manga ga Sugoi! 2015's Series Ranking for Male Readers". Anime News Network. December 8, 2014. Archived from the original on September 24, 2015. Retrieved October 16, 2015. ^ Saabedra, Humberto (December 11, 2015). ""A Silent Voice" and More Land on 2015 Top 20 Manga List For Male Readers In Japan". Crunchyroll. Archived from the original on March 5, 2016. Retrieved October 16, 2015. ^ "Attack on Titan Tops Da Vinci Magazine's Ranking for 2nd Year". Anime News Network. December 8, 2014. Archived from the original on December 30, 2014. Retrieved October 16, 2015. ^ Green, Scott (February 7, 2015). "Japanese Readers Pick the Manga Series Set to Make Their Big Break in 2015". Crunchyroll. Archived from the original on September 23, 2015. Retrieved October 16, 2015. ^ "Japanese Bookstores Recommend 15 Top Manga for 2015". Anime News Network. February 4, 2015. Archived from the original on October 2, 2015. Retrieved October 16, 2015. ^ Green, Scott (February 5, 2015). "Bookstore Workers Pick Top Manga to Read in 2015". Crunchyroll. Archived from the original on April 3, 2016. Retrieved October 16, 2015. ^ "8th Manga Taisho Awards Nominates 14 Titles". Anime News Network. January 18, 2015. Archived from the original on January 19, 2015. Retrieved October 16, 2015. "Best Sellers - Manga". The New York Times. September 27, 2015. Archived from the original on September 26, 2015. Retrieved October 16, 2015. "Best Sellers - Manga". The New York Times. October 4, 2015. Archived from the original on September 28, 2015. Retrieved October 16, 2015. "Best Sellers - Manga". The New York Times. October 11, 2015. Archived from the original on October 11, 2015. Retrieved October 16, 2015. "Best Sellers - Manga". The New York Times. October 18, 2015. Archived from the original on October 13, 2015. Retrieved October 16, 2015. ^ "Best Sellers - Manga". The New York Times. December 20, 2015. Archived from the original on December 18, 2015. Retrieved December 11, 2015. ^ "Best Sellers - Manga". The New York Times. May 1, 2016. Archived from the original on April 27, 2016. Retrieved April 22, 2016. ^ "Best Sellers - Manga". The New York Times. July 24, 2016. Archived from the original on October 4, 2016. Retrieved September 10, 2016. ^ Creamer, Nick (June 9, 2015). "The Ancient Magus' Bride GN 1". Anime News Network. Archived from the original on October 15, 2015. Retrieved October 16, 2015. ^ Creamer, Nick (October 16, 2015). "The Ancient Magus' Bride GN 2". Anime News Network. Archived from the original on October 17, 2015. Retrieved October 16, 2015. Gilson, Che (January 19, 2016). "[Review] The Ancient Magus' Bride". Otaku USA. Sovereign Media.